The Haliburton Highlands would like very much to challenge the Muskokas as "cottage country." Lakes, forests and rolling hills provide all-season enjoyment whether it's riding an ATV through the bush or dogsledding and cross country skiing in winter. Rafting is popular in the Haliburton Highlands as is the Haliburton Forest and Wild Life Reserve. The Dorset Lookout Tower is an unforgettable panoramic view of the area. Museum fans will enjoy the Haliburton Highlands Museum, the Minden Hills Museum and the Wilberforce Red Cross Outpost Museum. Haliburton Highlands accommodations include hotels, motels, bed and breakfasts, campgrounds, cottages and cabins. All rooms at this Inn in Haliburton has free wireless internet, small fridge, hairdryers, TV and coffee maker. To ensure an undisturbed vacation, there are no phones in the room, but there are phones available in the lobby for your convenience. Daily housekeeping. 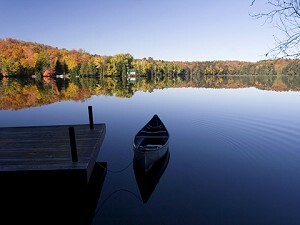 Nestled in the natural beauty of the Haliburton Highlands, just two and a half hours northeast of Toronto. Our Resort & Conference Centre offers one of Canada's most picturesque settings for a meeting or conference, wedding, golf getaway, family vacation, or romantic escape. Choose comfortable country-style accommodations from rooms and villas to chalets. Located in the Haliburton Highlands, this motel features an outdoor pool and an on-site restaurant. Free Wi-Fi access and cable TV are part of every room. They are furnished with a work desk and equipped with a refrigerator, microwave, and tea and coffee-making facilities. Guests can relax in the private hot tubs or use the on-site barbeque facilities. Near Highway 16, this bed and breakfast offers airport and local transfer services. It features a full daily breakfast and a common guest lounge with kitchenette and fireplace. A work desk and a seating area are provided in each room. Most rooms offer an en suite bathroom, a TV, DVD player and iPod docking station. It offers on-site fishing, kayaking and cycling on site. We are located just minutes north of Minden, Ontario in the heart of the Haliburton Highlands. Set amongst mature pines and birches on the shores of Twelve Mile Lake, the Red Umbrella Inn offers a wide range of accommodations including cottages, motel style rooms and the main inn. Comfortable, convenient, well-established, lakeside B&B in Minden is ideal adults. Private waterfront property, sand beach, spectacular views, separate entrance, easy offstreet parking. Healthy & hearty breakfast included and free Wifi high speed internet. Lots of local attractions. Our Lodge in Minden is the perfect hide-away for adults wishing to step back, relax and enjoy the abundant natural beauty of the Haliburton Highlands. Heather Lodge is casual and elegant, combining all the charm and ambiance of an old lodge with the luxury of a modern Inn. Dinner and Breakfast are served in our dining room and on the patio deck, surrounded by the trees and overlooking the lake. The Motel is located north of the town of Minden. We offer reasonable rates and spotless, comfortable, air conditioned accommodations with wireless high speed internet access and satellite TV. Surrounded with beautiful forest, is situated steps away from the shore of the crystal clear lake. Situated in Minden this secluded bed and breakfast is 10 kilometres from Haliburton Nordic Trails. Each quaint room features a 2-person spa bath and rain shower. Boasting romantic decor and antique furnishings, rooms include free Wi-Fi. A bathrobe and slippers are provided. Complimentary snowshoes are available. Haliburton Highlands Golf Course is 15 kilometres away. This Campground in Coe Hill provides a natural environment to promote a relaxed family atmosphere. We have a clean, sandy beach where little tots can splash in safety and a diving raft, water trampoline & water slide for the more adventurous swimmers.